Movement is the most natural activity to keep body in its best efficiency or to regain the best conditions of functionality of the muscular and cardiovascular system after a period of inactivity or immobility caused by an illness or injury. Walking and running, carried out in a planned and repetitive way, start up a series of physiological responses that, if organized in a planned way, undoubtedly lead to an organic strengthening of all devices that are involved and interrupt the process of slow degeneration caused by the lack of long-term physical activity. The programming, also in this case must undoubtedly scrupulously follow the laws arising from knowledge of the chain of physiological responses , that Seyle define as " general adaptation syndrome " , so that the work programming is implemented with the maximum effect from our organic system. To respect this physiological principle , the work was divided into two cycles of 12 sessions each and the workload was circulated respecting the cyclicality, between the individual sessions, according to the diagram below. The customization of the training program is determined by the Cooper test result (6 min). Based on Body Mass Index BMI, for each program it is determined the number of sessions that compose the program, from a minimum of 12 to a maximum of 36, so that the proposed increase of load between various training sessions is proportional to the user morphology. Each "restart" program has been developed respecting physiological laws that regulate organic adaptation to an athletic work. For this purpose, training tables have been structured alternating load growing phases to discharge phases, for a higer degree of adaptability of the organism to activity in motion. For the construction of any training program is also required the date of birth, from which it is possible to obtain the "theoretical maximum heart frequency (FHMT)". 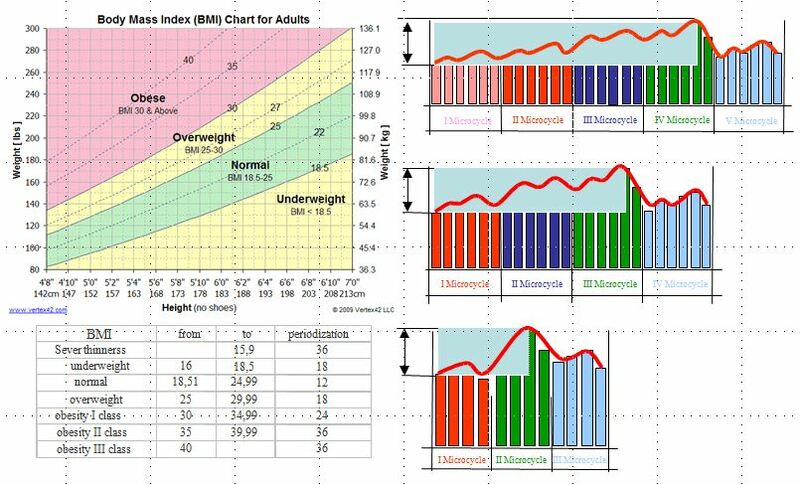 The FHMT, as safety factor, is pulled down to a specified percentage also determined as a function of BMI. The heart rate so obtained is reported in the head of the program, which warning not overcome in order to avoid "premature fatigue". As an additional safety factor for the user, it should be noted that in the "application form training program healt", it is mandatory the consultation of the Statement on health status. Referring to the example on a program of "health training" it is stated that each table indicates the work to do in a single day and it is recommended to alternate a day of work with a day of rest. After the training program, it is advisable to repeat the Cooper test to ask for a new one.